How do you connect to directly to 2000 dental professionals to get real response rates & measured results? Simple with our innovative Digital Key ; USB fused int print with personalised print and real-time analytics. After being approached by Stockdale Martin with this challenge we discussed their clients campaign and challenge to engage with dental & hygenist professionals to trail their new Sonicare Electric toothbrush range. They needed to contact 2000 clients in the UK at private dental practices offer a free Sonicare brush to use for 2 months, and then feedback their results and opinions. Their aim was to encourage the promotion of the brushes through real feedback and professional recommendations. 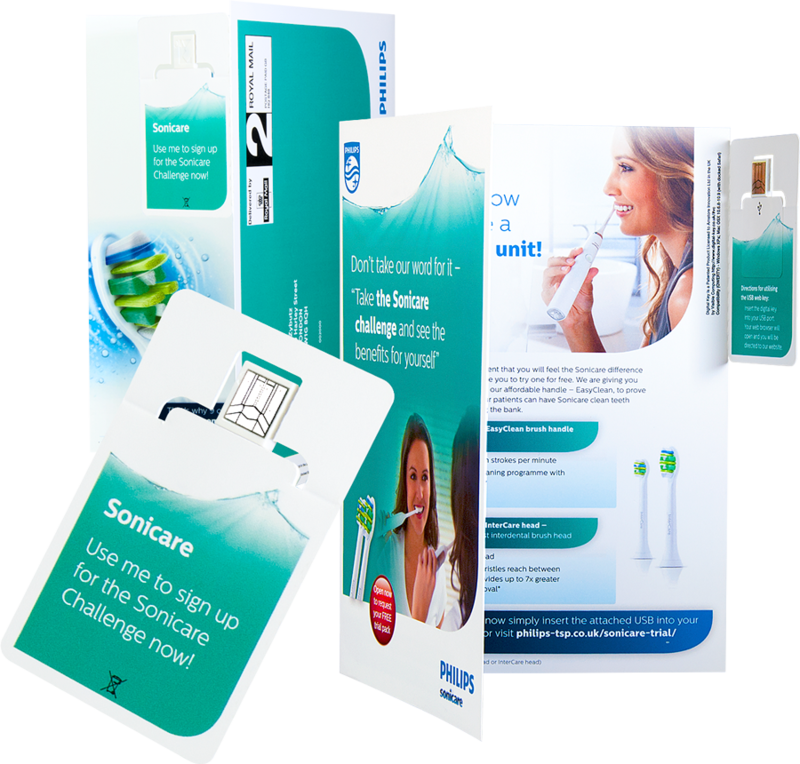 Our solution was to offer a personalised, mailable, digital key that would direct the user to the Philips Sonicare Campaign Website – there the user would sign up for the trail programme & fill in their details to receive a free toothbrush – as part of the trail the user would agree to feedback their experience during the 2 months. The goal was to find new stockists in the private dental sector & promote the brushes through professional endorsement. Under our direction, the final Digital Key solution included producing the hard-coded electronics directed to the Philips private URL with individual personalised numbering (0001-2000) at our factory in China, shipping them our digital print facility in London – where the A5 mailerpaks were produced with personalised address and numbering – using Philips 200 contacts database – infusing the electronics into the print and collating them for mailing. The finished units were then delivered by secure courier to our Royal Mail approved mailing house to be processed & dispatched to the recipients. When creating the electronics for the keys we also set up a bespoke, personalised, analytics dashboard. This allowed our client to login securely and track the hits and usage of each key and to see exactly which of the recipients had plugged the key in, where & when (in real time). So as the Digital Keys landed on doormats, the uptake could be viewed and the hits measured on a minute to minute basis. The result? a 28% request to take part in the trail and a 6% request to be a stockist of the Philips Sonicare range. A truly cost-effective, creative, measurable direct marketing product to represent a great and innovative product. The winning combination of a strong call to action, attractive branding and an attractive offer – resulted in resounding response rates and a very happy client.